Today was a hot day. We harvested some of our kitchen beds, weeded and trimmed perimeter plants and enjoyed a delicious salad with veggies from our garden. We prepared a chart that showed which beds had which veggies and the anticipated harvest date for each. Last wednesday in economics class, we practiced conducting interviews to present to different businesses by doing mock interviews. We also tried to come up with logo ideas to make a logo. 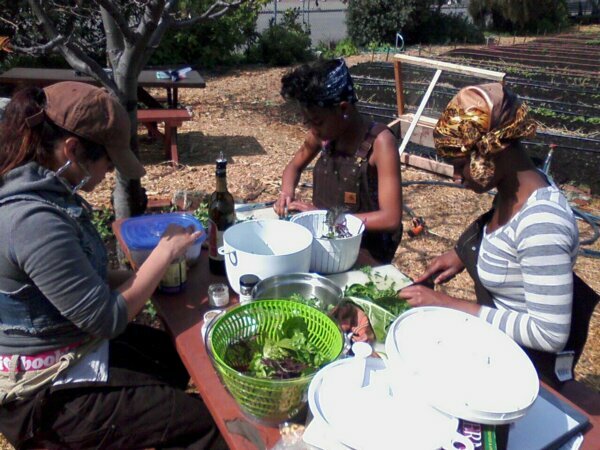 Pictured below: Tessa, Kasandra & Ale’ah make a salad with quinoa, cashews, cranberries and garden-fresh spinach, radish, kale, mustard, chard, radish, lettuce and pea shoots. The dressing Tessa made was balsamic vinegar, olive oil, salt, crushed red and black pepper. Yum!